This location is one of the Distinguished Seven Estates with their Own Private Motorized Gate along the Western Edge of Lake La Quinta! 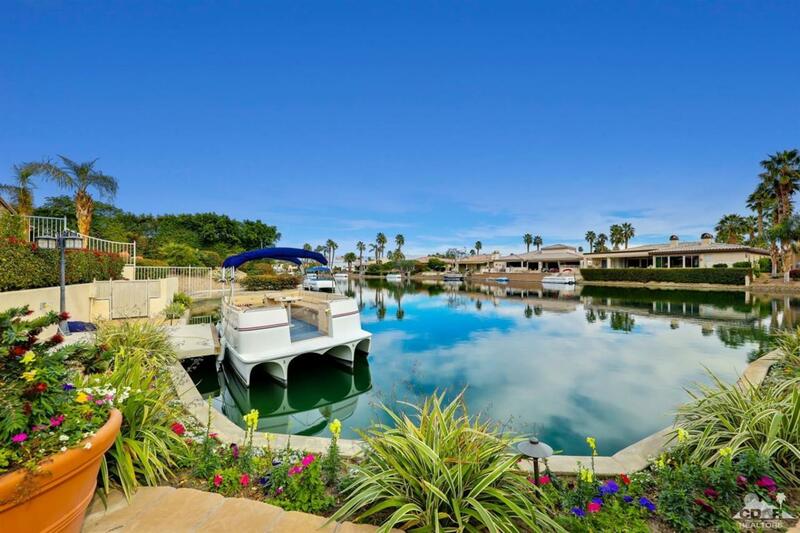 A Tuscany Mediterranean Style Beauty is Directly on The WATERFRONT!! This Compound Boasts: 4 Bedrooms, 4.5 Baths, including Casita, Approx. 3,400 Sqft. of Luxury and a Private Courtyard! As you Enter the Foyer to this Open Floor Plan of Archways...High Ceilings...and Elegance...you know you are at Home! An Entertainer's Delight, Offers: Gourmet Kitchen, Granite Counters (Center Inland), Stainless Steel Kitchen-Aide Appliances including Wine Fridge. The Great Room has a Custom TV Area, Fireplace and Dramatic 10 Foot Stacking Glass Doors to Enjoy Indoor/Outdoor Living. A Beach Entry Salt Water Infinity Edge Swimming Pool & Spa. Built-in BBQ, Outdoor Fireplace and Custom Shade Screens. Did I mention the Private Boat Dock and Your Own Boat as well? This Property comes Completely Turn Key Furnished! Believe..Dream..Imagine...You are Here!! Listing provided courtesy of Stephanie Gambrel of Homesmart Professionals.